Ever noticed how very few large apartment buildings are built in parts to face into each other, with a courtyard centerpiece? To this day, few multi-dwelling structures in Indianapolis do this, but that was not always the case. When the massive new I-65/70 highway carved its path through swaths of countless Indianapolis neighborhoods, one of the biggest such buildings was sucked into the undertow in the wave of obliteration. 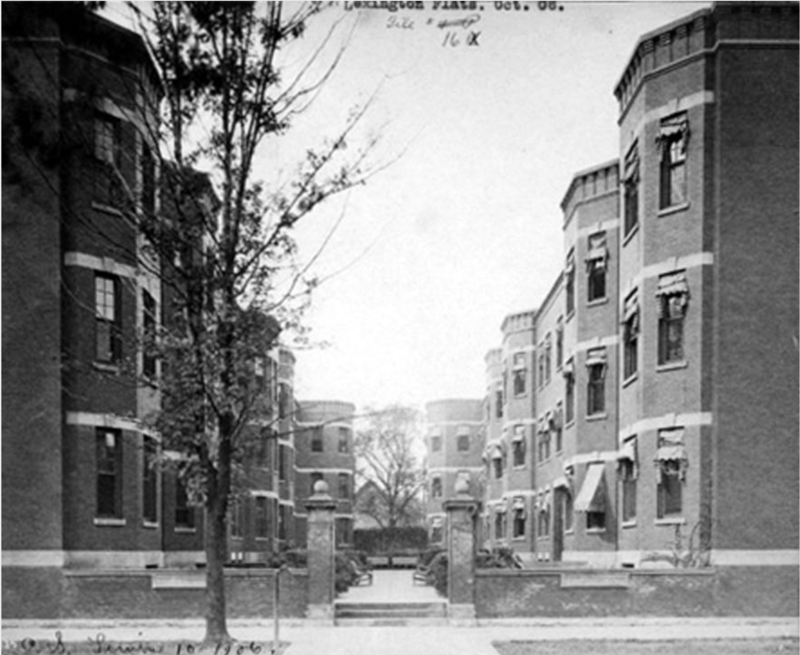 The spacious Lexington Apartments were designed by noted local architect, Adolph Scherrer. His flats faced off like three-story couples in a regency-era country dance on the newly renamed Capitol Avenue. Sixty units were divided evenly between the perfectly mirrored buildings and offered a few different floor plans. Preparatory excavations began in February 1901 estimated to be ready for occupancy about seven months later, by the middle of August 1901. The new apartments took up the best part of the west side of the block between 11th and 12th streets on Capitol Avenue. The Lexington’s early advertisements touted their four, five and six-room flats, with private halls, bathrooms, kitchens, wardrobes, linen closets and pantries. The brick and stone buildings also highlighted the bay windows and fire walls between each section of two flats. Whether or not it was the norm by this point, this building was outfitted with electric wiring in iron conduits, had steam heat and plumbing with cold and hot water. The building was designed with both electric and gas lighting, electric buttons controlling entrance doors, gas ranges, refrigerators, buffets, toilet cabinets, mantels, china shelves and screens–sounds fancy, right? In the basement was additional storage for each tenant, with bicycle storage noted specifically. The building featured porches and wide courts on the two “back” sides, facing north and south. Before the Lexington Flats were constructed, the bulk of that side of the block belonged to the family of John O. D. Lilly (no relation to the Eli Lilly family). 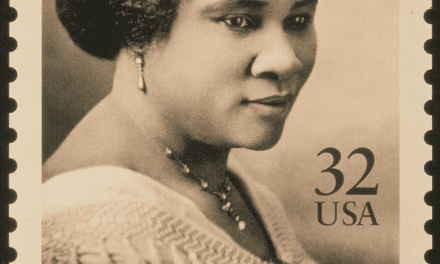 In January 1901, Charles S. Lewis purchased the Lilly land for $25,000. The parcel had a frontage of 249 feet and a depth of 165 feet. 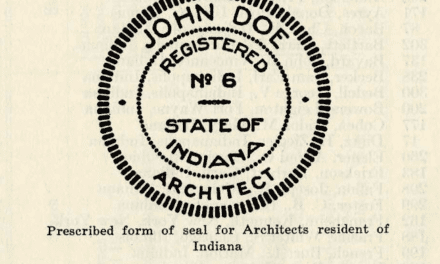 That particular stretch of Indianapolis real estate was originally owned by Indiana State Treasurer (1850-1853), James P. Drake, who in turn sold it to Allen S. Mays in 1854; he erected a home in the middle of the grounds. At that time, the entirety of the block belonged to the property. 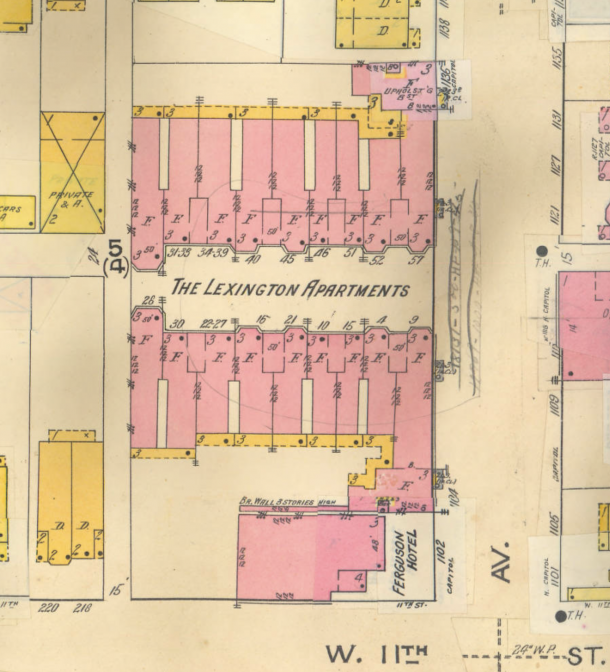 1866 map showing “Sunny Side” on the site where the Lexington Apartments later stood. Not a full decade later, in 1863, Mr. Lilly acquired the land. 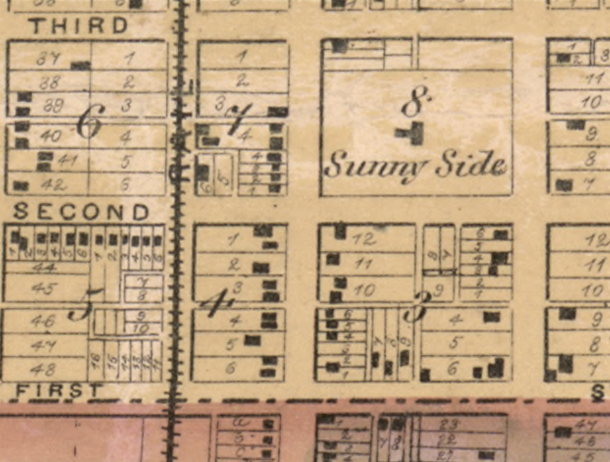 While he owned it, a detailed 1866 map shows the property as named “Sunny Side,” not to be confused with the early 20th century TB sanatorium on the northeast side. 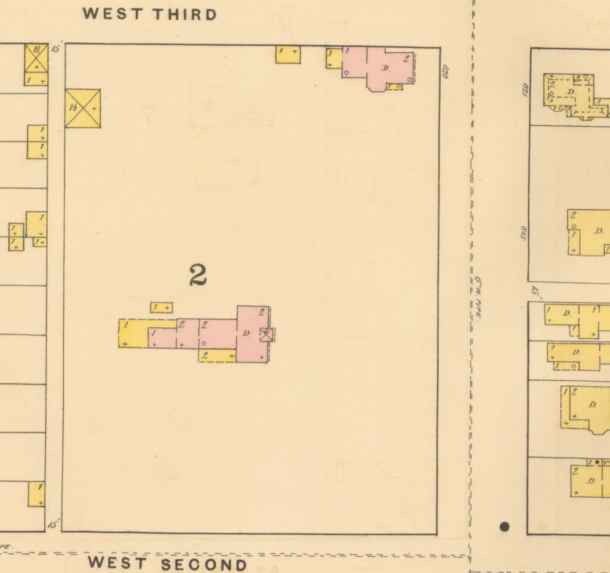 As Indianapolis continued to expand, Lilly sliced off and sold the western border of the block, facing Mississippi Street (now Senate Avenue), allowing the new lots a depth of 130 feet. The northeast corner of the property was “sold” to Mary E. Lilly, J. O. D. Lilly’s mother, who put a brick home there. Lilly’s homestead property was still far larger than most. 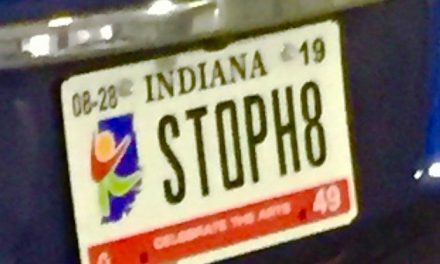 Clearly, this Mr. Lilly was also a successful Indianapolis businessman. After serving as the superintendent of the Madison & Indiana Rail Road in 1855, he served as a Colonel in the Civil War and later went into manufacturing industries. Most notably he found success in the paint and varnish industry, first partnering with Henry B. Mears for a period of time. He bought out Mears in 1874 and incorporated his sons into the business, rebranding as J. O. D. Lilly & Son. On a spring 1888 visit to his brother in Pennsylvania, J. O. D. Lilly met with an unexpected and grizzly fate. While walking along train tracks in one direction, and to avoid an oncoming train, he stepped over to parallel tracks without looking, where another train was hurtling towards him from the other direction. What a cruel irony that his years superintending trains caused him to lose his hearing. The family business was reorganized just months after the patriarch’s death and renamed the Lilly Varnish Company. Lilly Industries, which still exists today, is a descendant of these afore-mentioned companies. Who knows if this property would have met the same fate had Mr. Lilly not been in that accident, but his family sold the property just a few years later and in August 1894, the large brick Lilly house, at one time considered one of the landmarks of the city, was razed. Just as the Lexington Apartments would be later. When it came time to scrape this property of its buildings again, it was far more jarring. The construction of I-65/70 was displacing hundreds of families. Many who lived at the Lexington by that time were elderly. And black. In 1949, the Home Buyers Security Association, non-profit run by and for blacks, purchased the building in what was believed at the time to be the largest building owned by a black organization in the country. 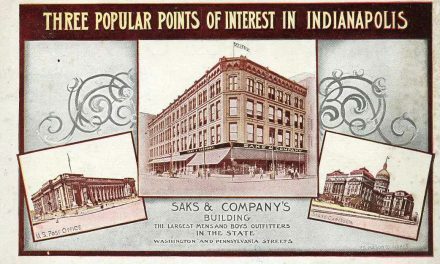 There were 92 units by that time and immediately advertisements changed to reflect the new ownership and direction for the building. Indiana Avenue, well established as the neighborhood of the black community, needed more living space as the community grew. 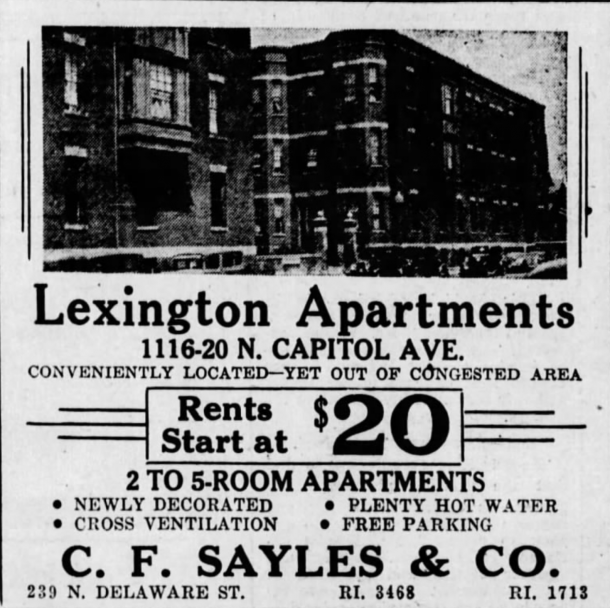 With the unfortunate sentiment in the rest of the city, that one group of people should remain huddled together in one specific geographic area, expanding to nearby blocks made the most sense, and for the rest of the life of the Lexington, it appeared in advertisements as a safe place for “colored” people to live. By 1967, the building was vacant and ready to razed. It had been home to hundreds, and more likely, thousands of people through its 66 years as an apartment building. Few images of the building are known to exist, though we found one classified ad from 1930 (below). Today the site betrays no sign of the many families who once lived there and stands barren under the roaring highway traffic.